Today was an eventful day. I got off shift at 8 am, got home around 12:15, and gathered up the troops to go raspberry picking. 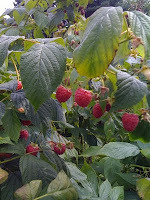 There is an organic raspberry farm near us and, in the 3 years I've been going there, I have never seen the raspberries so plump or plentiful. All the rain, I guess. Anyway. It took me less than an hour to fill a huge bucket, and the kids helped with little buckets. In total, we picked 7 pounds of raspberries, but that included 1.5 pounds for our friend's children who participated in the picking. So we brought home 5.5 pounds. "Mom? I'm only going to help pick if you make me a pie. Please? I want a pie." So I made a fresh raspberry pie. Baked a frozen pie shell for 12 minutes, filled it with fresh raspberries, and topped it with a thick sauce consisting of 1 c. sugar, 3 T. cornstarch, 1 c. crushed raspberries, and 1/2 c. water, boiled until thick. The pie then was refrigerated until after dinner. And it was GOOD. Mmmm. On to the canning! After some soul searching and discussion with the family, we decided we had enough jam. *gasp! 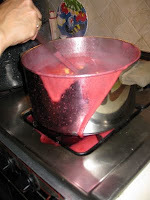 * However, I had just enough left to make raspberry syrup. Out cam e the food mill, which made a big mess, but got me exactly 6 cups of puree. And a lot of leftover seeds (more on that later). I decided I didn't have time tomorrow so I would tolerate some solids in my syrup, and started stirring. I looked away for 1 second (or so it seemed) and it boiled over! What a mess - much, much worse than the food mill! And, (this is the worst part, since I hate wasting things), I lost probably 3/4 c. of syrup. Drat! The final yield was 3 pints, 2 12-ounce jars, and 1 half-pint. Plus a little extra which we will likely use for breakfast. The leftover seeds were forced into a bottle and white vinegar was added, maybe we'll get some raspberry vinegar out of it. We also brought out a bottle of vodka and added some of the pulp to it as well. Another experiment. The rest was frozen in case any of these experiments are successful or there are others out there who know what to do with seedy raspberry pulp. Do you have any suggestions? I tried making raspberry liqueur a couple years ago, but it ended up tasting like kool-aid. Let me know how yours turns out. I've got a half dozen bottles of the stuff stashed in the cupboard and wouldn't mind finding a way to make it taste better. 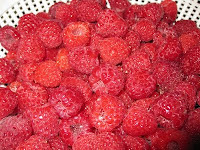 I also canned up some raspberries I got around 10 pints hubby and I did corn today and ended up with 18 pints. Ooh, corn? Do you just pressure can it or do you make it into relish? Do tell! I have not yet done corn. And, Deirdre, the raspberry vodka definitely has a raspberry flavor, but I would mix it in a drink rather than have it straight. I mixed it with the pear syrup drink I made last week and it worked pretty well. Steve suggested a raspberry beret. Kidding. Seriously, the raspberry syrup might be tasty over an ice (snow cone?) or worked into a granita. The leftover raspberry pulp might lend itself to a vinaigrette. You know, that song always is in my head when I work with raspberries. It's infectious. The syrup is really thick and basically gels when it's at room temperature, so it might not work on an ice, since it would have to be hot to pour it, but in a mixed drink it might work. Especially if there is a blender involved.